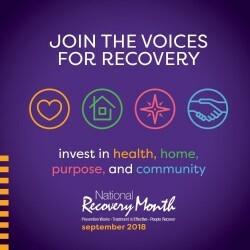 Every September, Substance Abuse and Mental Health Services Administration (SAMHSA) promotes Recovery Month to increase awareness and understanding of mental health and substance use issues and celebrate communities. During the month beyond, many of the recovering millions will stand up, stand out, speak out, and be proud of their recovery. Faces & Voices of Recovery annually designates a city for a national hub event. This year it is in Denver, Colorado. Advocates for Recovery-Colorado will hold a Rally for RecoverWe in Civic Center Park on September 15. It begins with assembly and registration at union station at 10 a.m.. Beginning at 11, all will walk down the 16th Street Mall to the park. The music, faces and voices of recovery, food and fun fills the afternoon. On a solemn note: This year’s rally features a Remembrance Tree for those lost to the substance use disorder we know as addiction. Our sponsors and resource providers are there to inform and encourage those who seek recovery for themselves, family members, and friends. The event concludes at five but the celebration of recovery continues and grows over time. Under the banner of Faces & Voices of Recovery, there will be many rallies and other events across the nation in September. They are worth time, attention, and support through presence and participation. Those in the prevention, treatment, and recovery fields have constituencies of consequence. Those constituencies have faces and voices. The crisis needs informed and dedicated messengers and advocates to overcome the illicit drug crisis that creates economic, health, and family tragedies that plague our nation. The rallies and events are information resources for all. We have a national recovery movement. We could say that we need a WeToo movement that focuses on overcoming substance use disorders. Carl Sagan was noted for his perspective on the universe and spoke of billions and billions of stars. He said, however, that extraordinary claims require extraordinary evidence. The Hubble telescope now provides evidence to support past extraordinary claims. Our small universe in the United States has been skeptical of what seemed to be an extraordinary claim: recovery from addiction is a reality. There is an old cliché that says, seeing is believing. We could expand that to say, Seeing and hearing is believing. Believe me, the stories of recovery are powerful. The evidence lies with the lives and stories of millions and millions of people. Statistically reported to be twenty-three and one/half million. They are the evidence. The number could be a lot higher if there was more access to treatment and recovery and there weren’t stigma and discrimination preventing people from getting help. To assist in overcoming stigma and discrimination, Faces & Voices of Recovery has changed the language used to describe those who suffer from addiction. Just as the Hubble opened the heavens, the studies and findings about the science of addiction, now identify addiction as a substance use disorder (SUD), a treatable mental health issue. As such, addiction can be treated with new discoveries in the medical field. Colorado’s Health and Human Services recently launched a campaign titled, Lift the Label. For more information go to LiftTheLabel.org. The social media hashtag is #LiftTheLabel. The Office of Behavioral Health is going after stigma as it relates to the opioid crisis. it states, Don’t let the label of addiction obscure the truth. Though not the case for other addictive drugs, it must be realized that opioid addiction is not always readily apparent; many who abuse opioids conceal it and can remain highly functional in their work and home life. In a previous blog I wrote: There are professionals with knowledge of the science of addiction who can prescribe appropriate drugs. Kaylin Klie, MD, says, There’s still an entrenched stigma against medication-assisted treatment (MAT) in the treatment community. Medication-assisted treatment includes the use of medications such as methadone, buprenorphine or naltrexone. However, the data clearly supports its use. It’s not debatable: we’ve seen significant decreases in overdose deaths, HIV and Hepatitis C transmission rates and other types of substance-use associated infections. People who are receiving MAT usually also have lower rates of incarceration and are more likely to retain custody of their children. These have coincided with increases in productivity and an uptake of medical and mental health treatment, meaning people are getting treatment for other health conditions while receiving medication-assisted treatment. I’m aware that there are many who believe a medication shouldn’t be used to treat addiction for another drug. However, these concerns simply do not stand up to any kind of examination. MAT boasts a significantly higher success rate (60-90%) than the non-medication treatments (5-15%). If we accept this data, the results should be evidence that great value can come from cost reduction and should be the goal of government and consumers. MAT can obviously be effective in stopping craving and allowing the brain to heal. Be not afraid, and be informed that medically-assisted recovery, coupled with therapy and peer support services, will promote long-term recovery and a life of hope, health, and happiness.